Blank at best dejected at worst. I can almost hear the thoughts running through their heads. We all bloody well know if we were brimming with self-belief everything would be easier! And because it is easier, we’d believe in ourselves more; because we’d believe more, we’d do more, and the whole chicken egg thing kicks in. Where should we go to get the self-belief everyone is telling us to get? Can we buy it, is it in a book, a blog? Maybe my friend can give me some of hers? Maybe a new car, or dropping 5kgs, will make it miraculously turn up? Or am I out of luck. Unless I was gifted massive self-esteem from my totally tuned in, on-to-it, positive parents, is the quota of self-belief I have now as good as it gets? It’s a lazy piece of advice. The people giving it mean well, but it’s hollow and of no use. It’s a bit like telling a massively overweight person to eat less, or an alcoholic not to drink. I reckon they’re on top of the theory, just struggling a little with the “how to”. Pretty much all the things highly valued in life require effort. Building self-belief is one of those things. Our beliefs are the foundational code that defines every choice we make and everything we create; there is no quick fix – no ten simple steps to creating or changing beliefs. However, we can change a belief almost instantaneously with new evidence. It’s creating new evidence that often requires a courageous heart and a willingness to do things differently. I want to tell you a story about Suzy, so we’re on the same page with this concept of beliefs and how they are created. Suzy’s a family friend; I have watched her grow-up. She had a strong belief that she was no good at sport, to the point that she’d use this statement to describe herself. Suzy’s family was super sporty. She wasn’t as outgoing as her Dad or brother and often felt intimidated by physical activity. At school she was shy and uncoordinated; she avoided sport whenever possible. Her parents started saying, “that’s not really Suzy’s thing” – thinking they were doing her a favour. By her early teens, I often heard her jokingly refer to sporty girls as butch, echoing statements she was drawn to in the media. Whenever she was forced to participate at school she felt stupid, as she was often last. To save face she told everyone sport was dumb. The 20-year-old Suzy had created a belief about herself, that she was hopeless at sport. In her mind it was grounded in solid evidence, it didn’t matter what people said, how many books she read, or inspiring video’s she watched, she believed they didn’t apply to her. By her mid-twenties, she was often getting sick and was a little overweight. I wanted her to start moving more, but she couldn’t see it. Fortunately, the universe intervened; everyone at her work signed up to be part of the office triathlon team, and all the social stuff was now based around this group. Her fear of missing out outweighed her belief that she was useless. In an excited moment, she signed up. I watched her, hoping she wouldn’t quit. In those first few months it was extremely difficult. Her body protested every foot fall. Her mind was her biggest enemy, regularly shouting a chorus of lines she had heard and internalised her whole life. Fortunately, a stubborn flame had been ignited and Suzy kept going. As each week passed she felt small changes. At the beginning, she was only running lamppost to lamppost. It progressed to two, then three, until she didn’t need to stop. She was sleeping better, and heaps of people were telling her how bright her skin and eyes were – it was enough. Those little compliments, warm nuggets of yumminess, pulled her forward. After feeling like a drowning donkey, she was now able to swim ten lengths. Not an Olympian, but where once she had believed she’d struggle to save herself, she now had a new reality. The biggest thing I noticed was her confidence, the way she stood and interacted with people, looking them in the eye, shoulders back. By choosing to do something totally out of her comfort zone, and sticking to it, Suzy created new evidence; that new evidence changed her belief. It didn’t feel easy or normal when she started. It felt hard. All her previous experiences and harsh self-talk were telling her to quit. But the repetition created results, those results and the encouragement from others, changed her internal dialogue from, “I’m not good at this” to, “I can do this”. We cannot change a deeply held belief by reading books or attending seminars. These will help get our mind-set right. But they will not make a lick of difference unless we take action to rewrite the beliefs given to us as children, or those created by the choices we’ve made. I struggle with the beliefs I have about my body, and love. I held a strong belief that I was invisible, not seen nor heard. I’ve spent my life shouting from roof tops, often being as outrageous or controversial as possible, desperate for validation. This belief is not true, it was created from my youthful interpretation of events, giving me a pair of sunglasses that coloured how I saw the world. Learning to take those lenses off, and see love, acceptance and kindness – not deception and danger, changed everything. What beliefs are defining you? Think about it. What are your beliefs around money? Is it hard to get, or do you believe there is plenty of it? 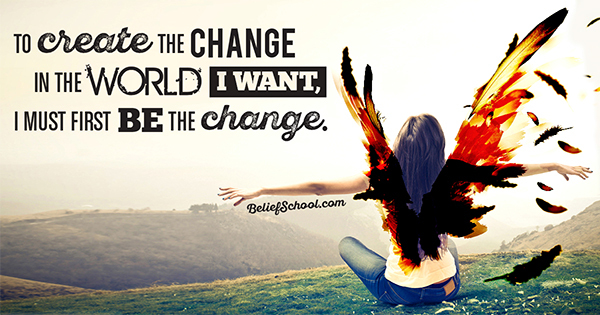 This belief will dramatically impact on how much of it turns up in your life. How do you describe your body, your mind, your intelligence? Do this quick exercise to create some awareness. Write down a list of 20 beliefs you hold about yourself. Start each sentence with, I believe…………..
Once you get past ten, if you think deeply and honestly, you’ll get a glimpse of the positive and not so positive beliefs you have. These beliefs are setting the boundaries that define much of your life, your choices and your possibilities. Suzy changed a belief about her physical ability. In doing so, she built her belief in herself. She took a leap of faith, faced her fear and followed through with her commitment. By being part of the team she contributed to her work community, this showed her she mattered. Whatever you want for your life, believing in yourself and your place in this world is foundational. It is not a 5 step program, nor a shiny new car. It is the principals we teach at Belief School. Understand them and practise them every day. Setting yourself up to win, see the love around you, create value for others, do what you say you are going to do, and give expecting nothing in return. When you be this person, the path will unfold before you, doors will open, friction will fall away and you will love who you are. Nicely said Paula. Acting our way into believing and feeling is scary sometimes, but knowing the end result is worth it is the one truth that makes the grinding and persistence possible. Thanks for pointing that truth out to us! I’m digging the Suzy story – a very common girl belief. Thank you for bothering to help us all kick away unhelpful beliefs and self chat.